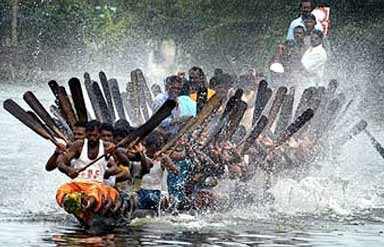 Celebrated in August -September, the Onam festival in Kerala marks the homecoming of the legendary king Mahabali. Women decorate their porches with exotic designs with rice paste, marigolds and seasonal flowers and place lighted lamps on them. Ladies and young girls dance around the traditional lamp and sing happy songs. 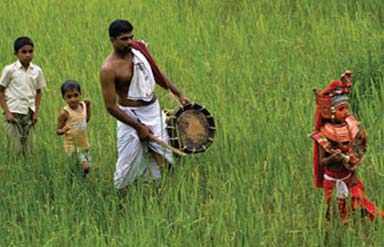 Though there are several legends associated with the Onam festival in Kerala, the most popular one is about the pious king Mahabali. Mahabali though a descendant of demons, was adorable, good and caring as a ruler. The people of Kerala worshipped him and there was a time when the gods and deities became jealous of Mahabali and prayed to Lord Vishnu to do something about the situation. It was then that the Lord descended on earth in the guise of a dwarf Brahmin and went seeking alms from the mighty Mahabali who was known never to have refused anything to anyone. When King Mahabali asked the dwarf brahmin to make his wish, the Brahmin declared that he wanted all that he could cover with three steps. 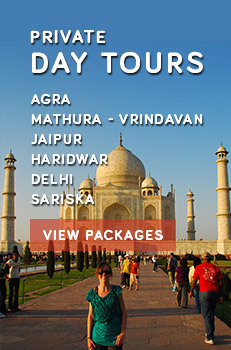 Mahabali granted this strange wish and requested the Brahmin to walk three steps. With one step the Lord covered the heavens, with the second he encompassed the land and the seas and before he could take the third step Mahabali recognized Lord Vishnu and bowed his head in obeisance under this third foot. When the Lord steeped on Mahabali, he went straight down to the kingdom of serpents. Because he was a good king and the people loved him the Lord granted him one wish that he could visit his land once a year to see if his people were happy. 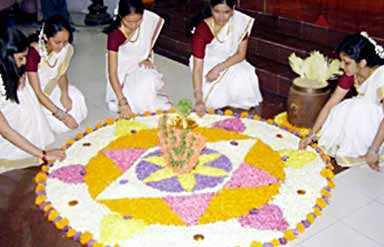 Thus the people of Kerala celebrate Onam to welcome their favorite king once a year with joy, gaiety and prayers.